Abstract - In new energy development, wind power has boomed. It is due to the proliferation of wind parks and their operation in supplying the national electric grid with low cost and clean resources. Hence, there is an increased need to establish a proactive maintenance for wind turbine machines based on remote control and monitoring. That is necessary with a real-time wireless connection in offshore or inaccessible locations while the wired method has many flaws. The objective of this strategy is to prolong wind turbine lifetime and to increase productivity. The hardware of a remote control and monitoring system for wind turbine parks is designed. It takes advantage of GPRS or Wi-Max wireless module to collect data measurements from different wind machine sensors through IP based multi-hop communication. Computer simulations with Proteus ISIS and OPNET software tools have been conducted to evaluate the performance of the studied system. Study findings show that the designed device is suitable for application in a wind park. 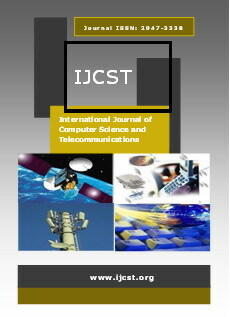 Abstract - In this paper, we design a downlink beamforming vector for a multiuser MISO cellular cognitive radio network with imperfect channel state information (CSI) at the secondary base station. The idea is to minimize the secondary BS transmit power subject to outage probability constraints to the QOS of the secondary users (SUs) and the interference power to the primary users. This led to a non-convex optimization problem but was reformulated to a convex-one using semi definite relaxation technique. The resulting problem can be solved efficiently using interior point methods. Computer simulations shows that the probabilistic approach used is more power efficient than the less flexible worst-case approach. Abstract - When one company sells two or more separate products in a package for a single price, it is called “bundling”. In this paper, it is described bundling in telecommunications area as a way which is used in Bosnia and Herzegovina by all operators with basic goal to keep existing users and increases average revenue per user. In this paper, it is described, as a case study, one operator network for realization triple play and quadruple play package and services which is used in that packages. It is pointed to actual architecture of the network for realization uniform service delivery, IP Multimedia Subsystem. Abstract - This article propose a cascaded connection of AWGs filters in multiplexers/demultiplexers by using the WDM_ Phasar simulation that results in total channel accumulated crosstalk reduction which allows for reasonable channel carrying capacity and hall communication in DWDM system. Obtaining the performance of AWGs filters before cascading and after cascading connections of different AWGs (8channels, 16 channels, 32channels, and 64channels) simulation designs. Selected different channels in different simulation design, obtained a comparison of crosstalk before and after cascading configuration. NNEBE Scholastica. U. and Nwankwo V.I. Abstract - The characteristics of RSSI shows that the received signal strength will decrease with increased distance but sometimes due to multipath effects there are variations and fluctuations in the received signal strengths. In order to analyse and evaluate signal measurements in an environment, it deem necessary to denote the pattern of the signal flow. This paper presents development of Received Signal Strength Indicator (RSSI) model of an indoor environment using TelosB sensor nodes. Real-time measurement of the RSSI was done extensively at the corridor of the first floor of Goddian Ezekwem building, faculty of Engineering Nnamdi Azikiwe University, Awka for several months. The average of the measurement was taken and used for the development of the RSSI model. Least Mean Square Error (LMSE) method of linear regression analysis was used to develop the model. The developed model was tested and the goodness of fit (R2) of the model was determined to be 0.86. This confirmed that the model can be used to determine the RSSI at any given distance of an environment with similar radio characteristics.